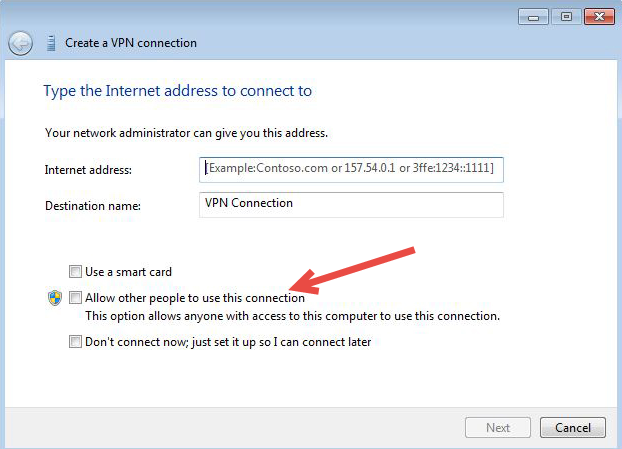 It would not allow a new VPN connection to be setup either, with the wizard instantly failing after you entered the remote IP address, or, accepting the remote IP Address but sitting on the ‘Creating the Connection’ screen indefinitely. I had recently troubleshooted a similar issue on a Windows 7 machine, whilst trying to install some Fortinet SSL VPN Client software, the issue on that occasion was perfectly described here, with a fix / cause discussed here. Unfortunately the fix here did not apply, or at least it did not seem to immediately solve the issue. Looking further into logs and registry keys, i noticed a lot of permission related issues in the event logs which led me to the solution which was ticking the box that creates the VPN for all users. Sadly I didn’t take any screen shots and I don’t see that option in another Windows 10 machine, so it may be an option you only see on upgraded machines, so i am using one from another OS.